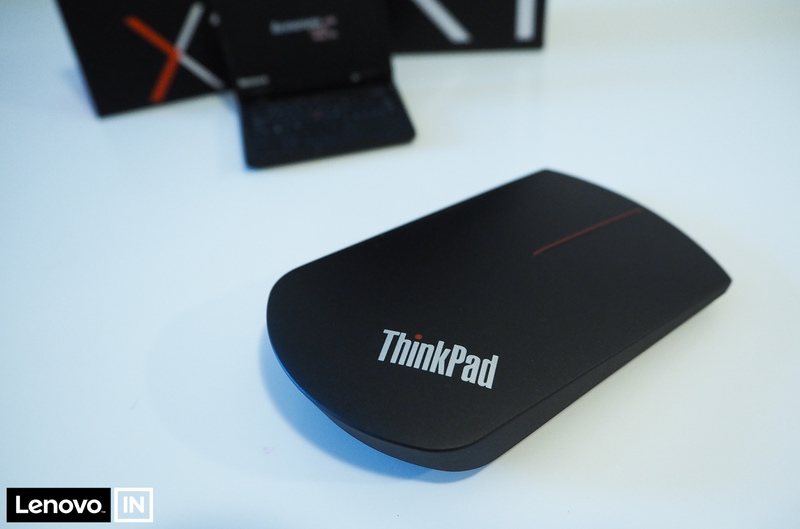 While ThinkPads have good touchpads and the TrackPoint, I find I still want an external mouse for extended work sessions. A good mouse is almost necessary to have when working for long times with your computer. 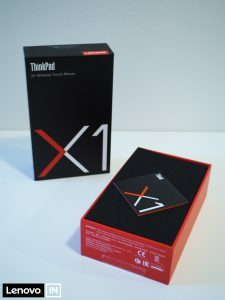 The X1 branded mouse is meant to accompany the X1 family of notebooks, that are top of the line working computers. 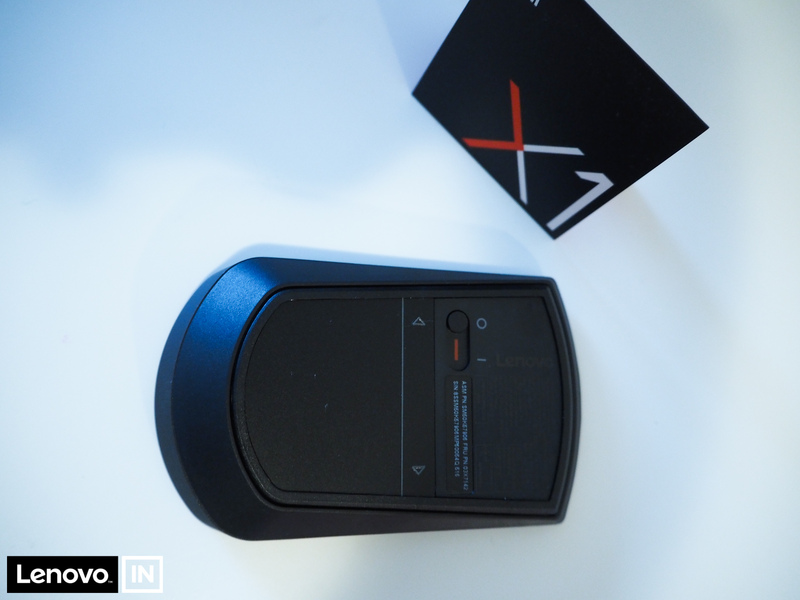 Will the X1 Wireless Touch Mouse be the perfect working companion? Let’s find out! 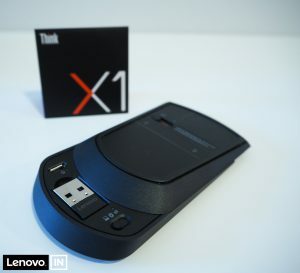 Disclaimer: The X1 Wireless Touch Mouse was sent to me by Lenovo as part of the Lenovo INsiders advocacy program. All opinions presented in this article are my own. This is the first article in my X1 Accessories series. 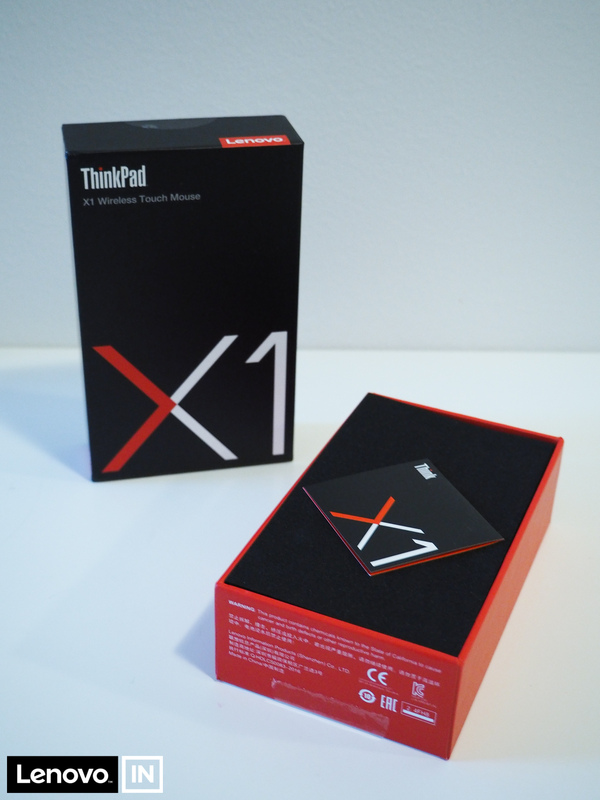 Read the second article about the X1 Ultra Sleeve. The X1 Mouse already replaced my previous “light and wireless” mouse and my presentation clicker (did I mention it can control your presentations as well?). It’s not the perfect mouse as far as mice are concerned (a little bit on the small side to be comfortable, especially for large hands), but it is a good travel mouse. 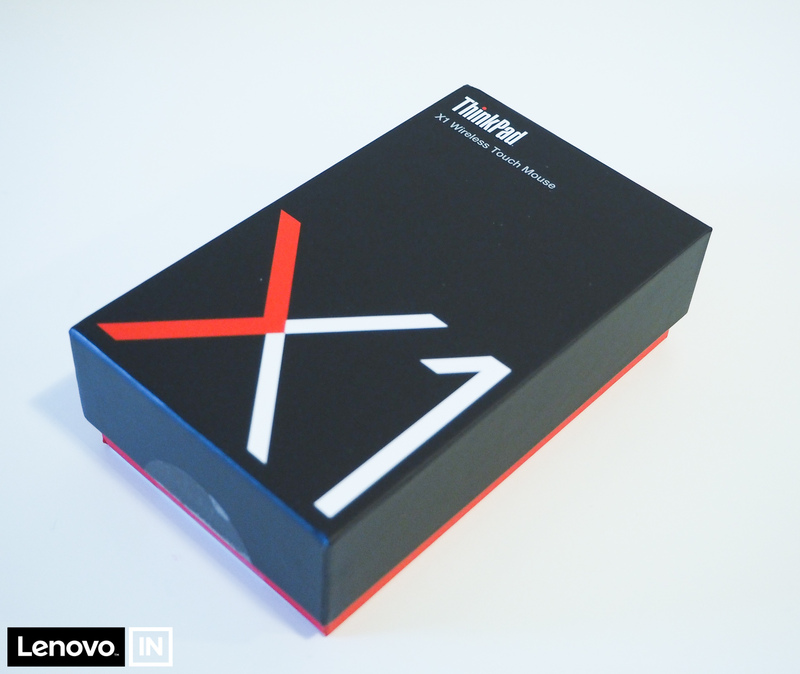 The X1 Mouse comes in a small box that features the red and black colors of ThinkPads. It resembles the X1 Yoga box in colors. Opening the box reveals a small leaflet, and under that you will find the mouse itself in a foam like material. Very nice packaging. The box includes a charging cable for the mouse and some paperwork. The mouse supports both a wireless dongle and Bluetooth. Both seemed to work flawlessly and really well, connecting the mouse to the computer was fast and easy. The wireless dongle is held in its little compartment by magnets, which is just an insanely great idea! Also, the compartment (and wireless switch and charging connector) is revealed by sliding the mouse open. The mouse feels precise, and works on different surfaces quite well. While it feels strange at first, after getting used to it, it works well. I find it too flat for my hands, I am used to working with mouse that have a thickness to them – not necessary big, but that you can feel them in your palm. The X1 Mouse is very flat, and you cannot rest your palm on top of it. There is no tactile mouse wheel, only a red touch strip in the middle. Slide your finger on this to scroll. It works surprisingly well. The top side is one piece, so you cannot tell the buttons apart. But there are actually three buttons in the mouse, it is just sometimes difficult to say if you press down on a place, which button will click. This gets a little confusing and requires some getting used to. (So there are three actual buttons inside the mouse, but the top plate is one piece of plastic, not separate for the different buttons). The User Guide actually does not point out that there is a third button in the mouse. I am not sure how this is implemented – it might detect that both buttons are pressed when you press down in the middle -, nevertheless I could use the third button in applications when pressing down on the touch strip. I find that I tend to accidentally right click with the X1 Mouse. I have not yet determined why this is, it might go away if I use it more. The bottom side contains the on/off switch. Which also is a genius design element: the sensor is hidden under this switch. When the switch is in the off position, the sensor is hidden. When you switch it to the on position, it reveals the sensor. The bottom side also contains the presentation controls. These can be used to move back or forward in a PowerPoint presentation. I always kept a presentation remote control in my backpack, should I need to run a presentation. The X1 Mouse has now replaced both this and my previous travel mouse. The X1 Mouse does not contain a laser pointer – something that is often included on presentation controllers. But the fact is, I have not used that pointer on my remote control anyway. Most of my presentation are on a screen – either on the notebook or on a big LCD display. And the pointer (at least red ones) are not visible on these. The mouse has an internal battery, that can be charged using a micro USB connector. I have not used the mouse so much to be able to judge battery life. The charging cable is a micro USB cable, so you need a USB port on your computer or a separate AC adapter that accepts USB plugs to charge it. The other end is the currently regular Type A USB connector. The battery charge is indicated by four tiny LEDs that are placed on the left mouse edge (left button). This indicate the charge when you turn on the mouse and also during charging tell you when the internal battery is full. I find the X1 Wireless Touch Mouse a great tool that I will be carrying with me in my backpack. It replaced two devices, and is lighter than any one of those (a smaller mouse and a presentation controller). I do find the mouse a little bit uncomfortable and too small for longer work sessions. I also tend to accidentally press the right button, but this did get better with usage. It will not replace my primary mouse, but I certainly like it and will be using it on the go. If you want an excellent travel mouse to go with an X1 notebook – thin and light – then you will find the X1 Mouse to be a great addition. If you want a mouse that doubles as a presentation controller, this is an excellent choice. If you prefer bulkier or larger mouse, or want a tactile wheel / third button, then you need to look at other mice. In this case might I recommend the Lenovo Professional Wireless Laser Mouse!